… explores the stories we tell ourselves about money, how society keeps us spending, why it’s so hard to save, and how to turn it all around to your advantage. Discover what’s been holding you back and create lasting, healthy habits. It reveals how being happy can actually make your financial goals a reality then unlocks the secrets to having that happy, fulfilling life! Guiding you through the easiest and most accurate budget tools, you’ll get a clear picture of your current financial position, a focused vision of your goals, and a concrete plan to get from where you are now to money success. Exercises center the material on your unique situation and it’s jam-packed with philosophies to live by and strategies to keep your money yours to get the good feeling of financial security. Special inserts help couples align their thinking and strengthen their relationships. Learn the 7 simple steps to build wealth, have the happiness money will never buy and the big things it can. 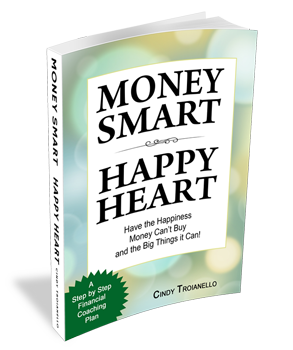 With its upbeat style and solid advice Money Smart, Happy Heart puts you in control of your money, accelerates your confidence, and super-charges your motivation! Find the forms in the book here. to inspire you, to build your confidence, happiness, and security, to increase your peace of mind, and to guide you to financial stability and success. If you’re in a relationship, I hope this book will help you find serenity and eliminate hassles and arguments about money.